Approaching the Robert Lehman Wing from the main entrance of the Metropolitan Museum of Art, most visitors pass through the gallery where an eighteenth-century choir screen from the cathedral of Valladolid is installed, catching a first glimpse of the jaw-dropping entrance to Manus x Machina: Art in an Age of Technology from a distance. Passing through the opening in the screen, they see a glittering gold garment, framed in a stone archway. From afar—and framed by the religious art and objects of the preceding galleries—the robe could be a royal or ecclesiastical vestment from a time long gone. And so begins a tour of the Costume Institute’s 2016 spring exhibition, on view through August 14th at the Museum’s Fifth Avenue flagship: the exhibition unfolds as a pilgrimage to a cathedral of fashion. 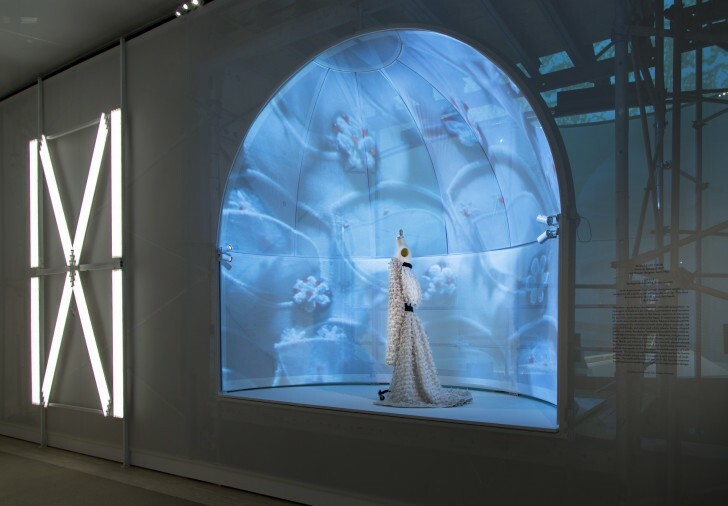 Upper level gallery view, Manus x Machina: Fashion in an Age of Technology; case study, wedding ensemble, Karl Lagerfeld for House of Chanel, autumn/winter 2014-15. Photo ©2016 The Metropolitan Museum of Art, New York. On closer inspection, the golden embroidery turns out to be the train of Wedding Ensemble, a masterpiece designed by Karl Lagerfeld for Chanel’s 2014–15 autumn/winter collection. 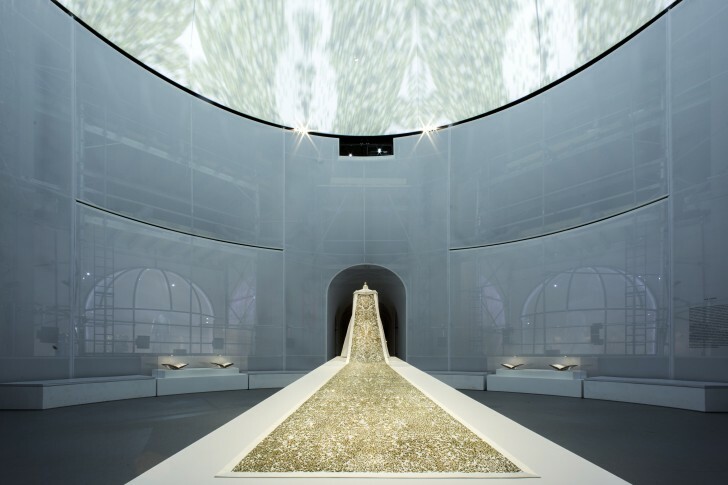 In addition to the stunning presence of the dress and its twenty-foot-long train, the ensemble perfectly encapsulates the premise of Manus x Machina, which encourages visitors to rethink the traditional notions of haute couture—and its famous emphasis on the hand (manus) and handmade—and prêt-à-porter (ready to wear), with its reliance on the machine (machina). This distinction has invariably been accompanied by a value judgment: with singular works of haute couture upheld as superior to their reproducible and repetitive prêt-à-porter cousins. But as Andrew Bolton, curator of the show and Curator in Charge of the Costume Institute, convincingly demonstrates, such a dichotomy is both contrary to how most designers work and an outmoded concept that neglects the many technological advancements and stunning innovations that have blurred the line between haute couture and high-end prêt-à-porter over the past century. To create Wedding Ensemble, for example, Lagerfeld made use of a combination of hand and machine processes: the design on the train was drawn by hand but then manipulated by a computer to give it a pixilated appearance. It was then painted by hand with metallic pigment, before being machine printed with rhinestones, and finally hand embroidered with pearls. On top of this, the dress itself is made from scuba knit, a synthetic material that was molded rather than sewn to form the shape of the dress. Such a dizzying array of techniques and materials (new and old), and the fluidity with which Lagerfeld moved between the hand and machine, prove the thesis of the exhibition in a single work: technological innovation is transforming fashion just as it is transforming all aspects of human life and artistic output. And this is not a bad thing; it has expanded the possibilities open to the fashion industry and, as this show amply demonstrates, it has also led to the creation of many dazzling, wearable works of art. Apple’s sponsorship of Manus x Machina aside, the blending of technology and fashion that is explored here has nothing to do with the notion of “wearable tech”—at least not as it is commonly written about and debated. So, those hoping to see examples of clothing that can monitor your heart rate or garments that synch with your smartphone be warned: this exhibition is not pitched primarily to the “techie” crowd. If, however, you are interested in seeing how designers are using 3-D printing technologies to take lace making in new directions, how the use of molded polyurethane foam has transformed the notion of draping, or how laser-cutting technologies have expanded the possible uses of leather in fashion, this exhibition will open your eyes to the many intersections between emerging technologies and the traditional métiers of fashion—demonstrating in the process how everything we wear today is, in some way or another, a marvel of technology. Upper level gallery view, Manus x Machina: Fashion in an Age of Technology; embroidery; case study, Raf Simons for House of Dior, dress, spring/summer 2014. Photo ©2016 The Metropolitan Museum of Art, New York. Manus x Machina extends over both floors of the Robert Lehman Wing, a series of circular galleries that have proven difficult to arrange in the past. The exhibition design provided by Shohei Shigematsu, Director of Rem Koolhaas’s Office for Metropolitan Architecture in New York, unifies the space through a series of semi-transparent white fabric scrims that reinforce the feeling that you are wandering through the apse of a pagan temple. In the central circular gallery where Wedding Ensemble is displayed, a detail of the golden train is enlarged and projected onto scrims hung on the ceiling. The projections rotate slowly and reinforce the vision of the space: the baroque pattern of the train resembles a gold-filigreed dome hovering ethereally overhead. Shigematsu and the Museum’s design department repeat this device throughout the exhibition, recessing certain dresses and ensembles within niches set into the scrims, onto which details of those dresses are then illustrated in shimmering, gently moving projections. The rest of the dresses are displayed against soft white backdrops that highlight their forms and details. A few well-placed video screens offer additional information on techniques, show craftsmen at work, or picture models wearing certain dresses. In spite of the crowds—and the exhibition was exceptionally crowded both times I visited—a sense of calm and of meditation prevails. This can be attributed both to the exhibition’s layout and to the soundtrack, Brian Eno’s “An Ending (Ascent),” a soothing, spiritual piece that heightens the contemplative mood of the galleries. Manus x Machina is organized into thematic sections that correspond to the six traditional métiers, or “crafts,” first described by French Enlightenment philosopher Denis Diderot in his Encyclopédie, ou Dictionnaire raisonné des sciences, des arts et des métiers (Encyclopedia, or Systematic Dictionary of the Sciences, Arts, and Crafts). Published between 1751 and 1772, the Encyclopédie provocatively places craftsmanship on the same level of importance as the arts and sciences, expressing Diderot’s desire to elevate the status of handwork above its traditional designation as “menial” labor. At the Met, open copies of the Encyclopédie are displayed alongside Lagerfeld’s Wedding Ensemble, setting the stage for the thematic groupings that follow: brodeur (embroidery), plumassier (featherwork), parurier floral (artificial flowers), plissé (pleating), dentellerie (lacework), and maroquinerie (leatherwork). 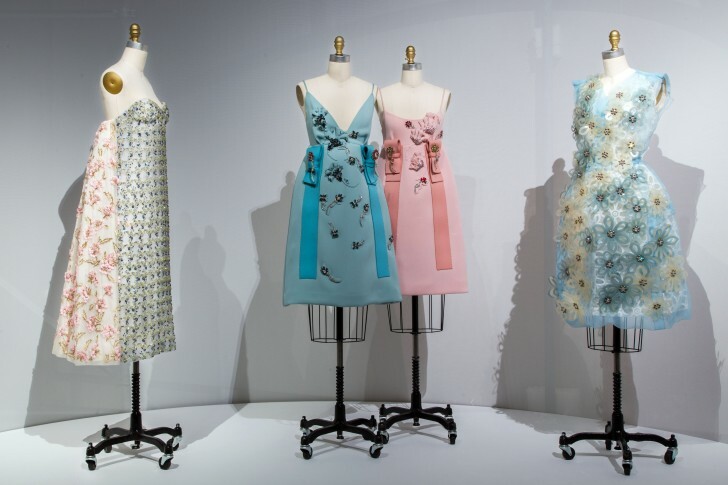 A seventh section, displayed in the adjacent Anna Wintour Costume Center galleries, is devoted to the traditional divisions of a fashion house, namely tailleur (tailoring) and flou (dressmaking). 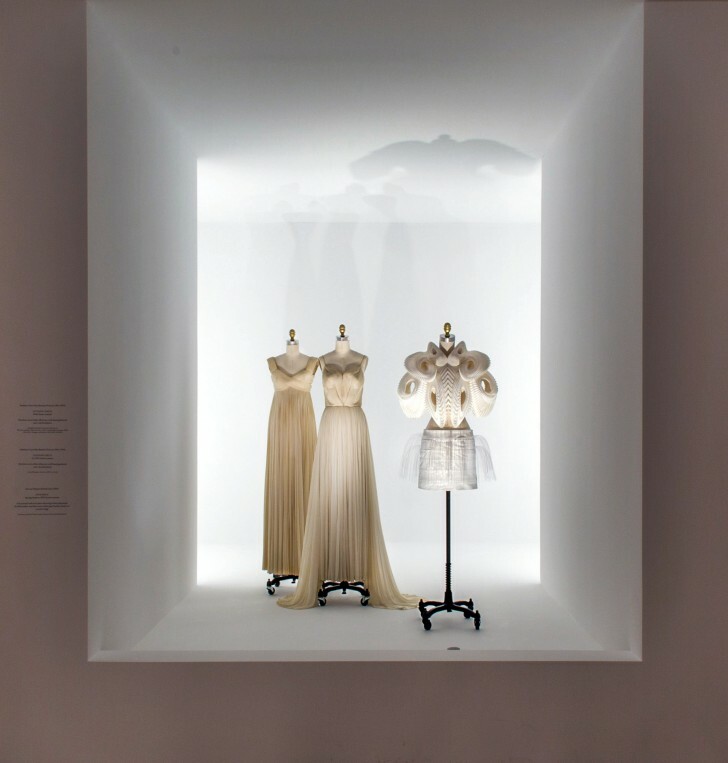 Upper level gallery view, Manus x Machina: Fashion in an Age of Technology; embroidery; Christian Dior, junon dress, and venus dress, autumn/winter 1949-50; Sarah Burton for Alexander McQueen, ensemble, spring/summer 2012. Photo ©2016 The Metropolitan Museum of Art, New York. The sections devoted to embroidery, featherwork, and artificial flowers are situated on the upper level of the exhibition, creating an outer ring that orbits the central gallery. All of the big names are represented within each grouping—Chanel, Dior, Prada, Yves Saint Laurent, Alexander McQueen—along with other designers such as Hussein Chalayan, Gareth Pugh, and Christopher Kane. Throughout the display, the informative and accessible wall texts explain that the fashion houses rely on specialized artisans, organized into their own houses or “maisons,” to execute most of the detailed work on display here. If it takes a village to raise a child, it seems to take most of France to create these stunning outfits, and it is one of the strengths of Manus x Machina that it helps pull the curtain back on the fashion industry, showing how celebrity designers such as McQueen and Lagerfeld rely on large numbers of anonymous, highly skilled workers to make their designs a reality. On this top floor, stunning examples abound in each grouping. Within the embroidery section, two case studies steal the show. 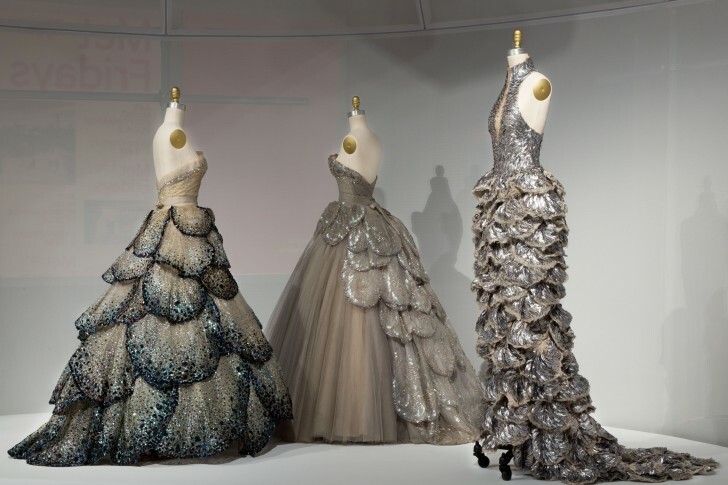 Yves Saint Laurent’s “Sardine” dress from 1983, with its iridescent, individually sewn sequin scales, and the ethereal “L’Eléphant blanc,” also by Laurent (but part of his debut collection for the House of Dior in 1958), which introduced his “trapeze” silhouette, both beautifully encapsulate the potential and allure of haute couture. But most viewers will be surprised to learn (as I know I was, at least) that two elaborate gowns designed by Sarah Burton for Alexander McQueen are prêt-à-porter: One is a silver confection featuring a fitted bodice with a high collar and plunging neck that is hand embroidered with silver gelatin feather pailettes and has a fitted, floor-length skirt adorned with architectural petals that have also been hand embroidered. The other is a coral-colored tour de force that transforms its wearer into a living coral reef—branches of coral and dyed seashells sprout from the shoulders and flow down the bodice of the dress. The artificial flowers section includes one of the most futuristic designs in the show—a cast-fiberglass, radio-controlled “dress” that is hung with Swarovski crystal and pearled paper “pollens” that are programmed to fly off the dress and into the air, like the seeds of a dandelion caught in gust of wind. Designed by Hussein Chalayan for the autumn/winter 2011–12 season, the “Kaikoku” Floating Dress is considered prêt-à-porter. A small video shows a model stepping into the dress through its rear-access panel and being wheeled around by remote control before the pollens fly off the dress and up into the air. (As good a party trick as this may be, I am not sure it is worth the cost of being at the mercy of whoever is manning the remote control.) On the other end of the spectrum, a gorgeous 1928 haute couture dress called Court Presentation Ensemble by Boué Soeurs combines the flapper aesthetic with references to earlier fashions. The filmy, sleeveless, drop-waist bodice flows into a high-low skirt that would still look current on today’s runways. Featuring both machine and hand embroidery, the skirt has also been hand appliquéd with garlands of handmade flowers. In a fascinating nod to the earlier aristocratic courts of Europe, the skirt flares outward from the hips in a way that recalls the vogue for the guardainfante in seventeenth-century Spain. I would wear it in a heartbeat. Upper level gallery view, Manus x Machina: Fashion in an Age of Technology; artificial flowers; Raf Simons for House of Dior, dress, autumn/winter 2012-13; Prada, dresses, autumn/winter 2015-16; Marc Jacobs for Louis Vuitton Co., dress, spring/summer 2012. Photo ©2016 The Metropolitan Museum of Art, New York. In this grouping, however, the curators would have done well to follow Coco Chanel’s famous advice to “remove one accessory” before leaving the house. Yves Saint Laurent’s Wedding Ensemble from 1999 is little more than a bikini made of pink silk flowers. With matching headdress and high heels sandals, it looks like the Eve portion of a bad Adam and Eve Halloween costume and seems particularly incongruous when displayed so near to Lagerfeld’s masterful, completely handmade Wedding Ensemble from Chanel’s autumn/winter collection of 2005–06: featuring bands of white ostrich feathers at the neck, cuffs, and hem, the dress is covered from top to bottom with twenty-five hundred of Chanel’s signature flower—the camellia—that have been delicately hand embroidered with sequins. The dress is an elegy to both the beauty of handwork and the amount of time and skill that went into its creation. The featherwork gallery is introduced by two versions of the same dress—one black and one white—by Gareth Pugh, fashioned from plastic drinking straws that have been meticulously cut and attached by hand. A label quotes Pugh as saying, “On the runway, you could hear them before you saw them. And they moved beautifully—like feathers caught in a gust of wind.” The description hints at one of the great drawbacks of this, or any fashion exhibition: unlike paintings, which are static objects, fashions are like kinetic sculptures, meant to be worn and experienced moving through space. Any dress, whether it is haute couture or prêt-à-porter, created by Dior or purchased at H&M, is activated by the body and gestures of its wearer. Seeing so many beautiful examples in one place arranged on cold, lifeless dress forms emphasizes the inevitable shortcoming of attempting to display and preserve these objects as in a traditional art museum setting. Downstairs, the exhibition continues with galleries devoted to pleating, lacework, leatherwork, and tailoring and dressmaking. Pleating receives two sections. In the first, Issey Miyake’s machine-pleated pieces are revealed through a presentation that displays each garment in two ways: laid flat and displayed on a mannequin, where the pleats take on their sculptural forms. Also in this section are a series of hand-pleated ensembles by Raf Simons for Dior. A short video displayed alongside the colorful outfits illuminates the process of hand pleating. In the second pleating section, a giant prêt-à-porter ruff by Junya Wantanabe for Comme des Garçons’ autumn/winter 2000–01 line is both humorous and a reminder that in fashion, everything old can be made new again—in this case, through the use of laser-finished, ivory polyester organza. Lower level gallery view, Manus x Machina: Fashion in an Age of Technology; pleating; Madame Grès (Alix Barton), evening dresses, 1968, and ca.1935; Iris van Herpen, ensemble, spring/summer 2010. Photo ©2016 The Metropolitan Museum of Art, New York. The tailoring and dressmaking display illuminates the difference between a tailored garment, which typically begins as a sketch that is translated to a two-dimensional pattern and then cut out and pieced together (the prime example being the classic Chanel suit, of which there are several on view), and a draped garment, in which the fabric is shaped and formed on a mannequin in three dimensions. Lacework and leatherwork are, perhaps, the fields where the intervention and innovation of technology have most revolutionized traditional processes: Even in haut couture, almost all lace is now machine made, the handmade variety being too expensive and time-consuming even for these intricate dresses. And processes for curing leather have made it more supple and easier to work with, while laser-cutting and bonding techniques have led to the creation of leatherwork patterns that are so delicate that they appear more like lace than hide. The star of the lower level, however, is Iris van Herpen, whose designs steal the show in both the pleating and lacework sections. Creating dresses that are more sculpture than fashion, Van Herpen uses 3-D printing techniques to model architectural forms that mimic the appearance of traditional lace and pleats. One dress appears to encase its wearer in a new skeleton that is at once futuristic and reminiscent of ancient fossils; another, fashioned of burnt-orange epoxy, features leaf-like forms that recall foliate lace. The French poet and critic Charles Baudelaire once said, “Irregularity, in other words, the unexpected, the surprising, the astonishing, are essential to and characteristic of beauty.” All of the works on display in Manus x Machina celebrate fashion’s ability to surprise, to astonish, and to create beauty. While handmade garments display the irregularities and “imperfections” inherent to individual production, the use of machines has systematized and expanded the reach of fashion, enabling the rise of an industry that is both lucrative and bursting with creative potential. Baudelaire was himself an avowed fan of Modernity and fascinated by technology’s potential—both good and bad—to carve out new frontiers. I can imagine him touring the exhibition and approving of it’s attempts to collapse the distinctions between pieces made with the hand and those made with the machine. After all, as the title of the show implies, one multiples the possibilities of the other, and if both are employed in the creation of beauty, then it can only be to the benefit and enjoyment of us all.